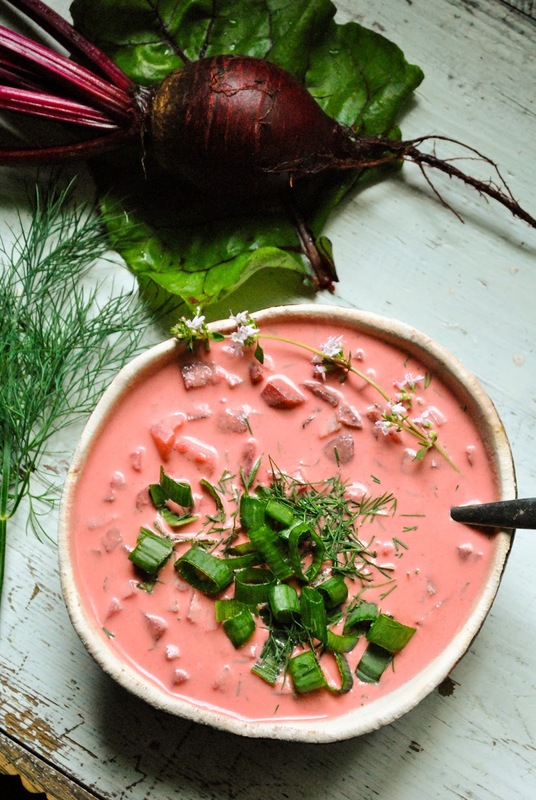 Cold beet soup with cashew "kefir"
Sunny hello from summery Estonia! How is summer treating you so far? We've had many rainy days and rather cold nights, but at least there's some sun and warmness now. I'm glad we had a wonderful vacation in Monaco in June, otherwise I'd be so sun hungry right now. But Estonian summer is breathtakingly gorgeous. We just celebrated my dad's birthday and the weather was perfect, along with people and food. And my mom's garden is out of this world. 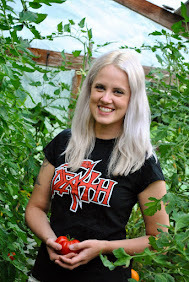 She works so hard and it shows - everything is so lush! From chilies and herbs to tomatoes, beans and veggies. I'm hoping we will have some beautiful sunny days in August. 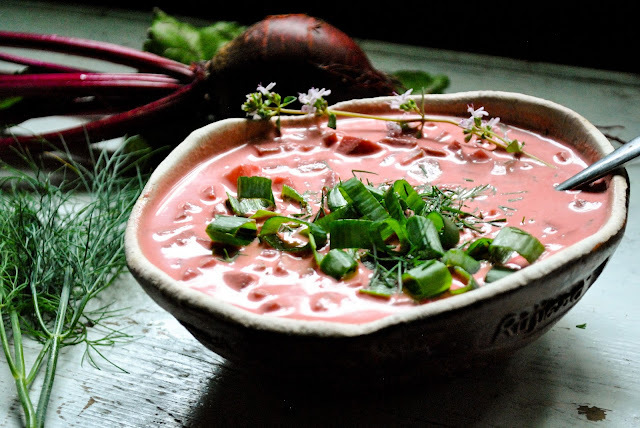 In that case, I will definitely make this cold beet soup again. It's SO good! Usually cold beet soup is made with kefir, but I used instant cashew "kefir" instead. I couldn't tell the difference to be honest. The wonderful cashew sauce is made with pickles and apple cider vinegar. If you have some leftover boiled potatoes, you can use them in this soup. Or you can also totally skip the potatoes. 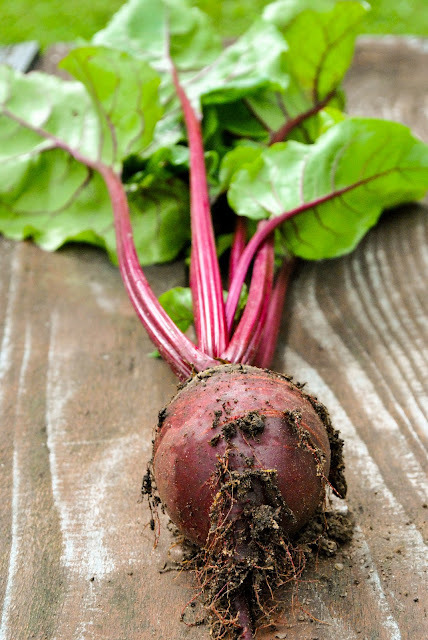 I used store-bought boiled beets, but of course you can boil them yourself. Keep this wonderful pink liquid gold in the fridge, so you will have a cooling and comforting homemade soup ready! Make the "kefir". If you don't have a high speed blender, soak the cashews for a couple of hours or boil them for 15 minutes. Drain and rinse with cold water. Blend the cashews along with dill pickles (cut them into 3 before blending), cold water, salt and apple cider vinegar. It should take a couple of minutes to get a creamy and not grainy liquid. Peel the beets and potatoes and cut them into small cubes. 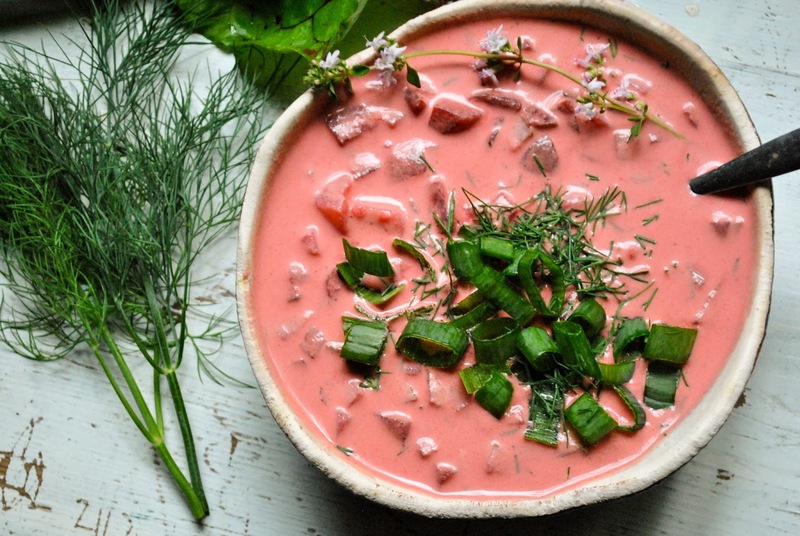 Mix the beet and potato cubes with cubed pickles, pepper and cashew "kefir". Put the soup into the fridge for at least an hour. The color will intensify when the soup sets. Serve with fresh herbs.